SHREWSBURY, MA– Started in 1986; Le Limo was founded by Natick High graduate and Framingham resident, Andrew Foilb, with the simple premise to “Listen to Our Customers.” That was the foundation tor their ongoing commitment to luxury and exceptional service. Thirty years later, Le Limo has become the standard bearer in the state for prestigious livery service. As evidence to their accomplishments, both Wedding Wire and The Knot, two of the nation’s leading online wedding sites have both announced that Le Limo Limousine has been voted recipient of their highest award for service and excellence. This is the fourth time Le Limo has been the recipient of The Knot’s Best of Weddings award, the recognition only goes to the top 1% ranked vendors based on customer reviews. The honor earns Le Limo a place in the media group’s Hall of Fame. The WeddingWire Couples’ Choice Awards 2015 is given to elite wedding professionals who demonstrate superior quality, service, responsiveness and professionalism. For thirty years, Le Limo has proudly set the quality standard as the area’s premium limousine company. While the organization has built an unsurpassed reputation serving the wedding industry, they also offer a full range of services to corporations, business executives, airport travelers, special celebrations and night-on-the-town revelers. The company’s corporate mission is to return customers to an era of unparalleled luxury. While many industry honorees are selected by the host organization, the winners of these awards are determined solely based on reviews from real newlyweds and their experiences. Award-winning vendors are distinguished for the quality, quantity, consistency and timeliness of the reviews they have received from their past clients. The company has a varied fleet that includes stretch limousines, sedans, SUVs, party buses, executive coaches, Mercedes Sprinters, stretch SUVs, a 1960 Silver Cloud Rolls Royce and a custom-built trolley. The company regularly turns over their fleet, in the past year they’ve added a new fleet of Lincoln MKS sedans, new MKT stretch limousines, new Mercedes Sprinter and a new Limo Bus, they call their Cabin Cruiser. To initiate its 30th year, Le Limo invited all of their employees to a night of fine dining and celebration at the Twin River Casino in Rhode Island. The company also released a special 30th anniversary logo which they’ll use all year to mark this sensational milestone. 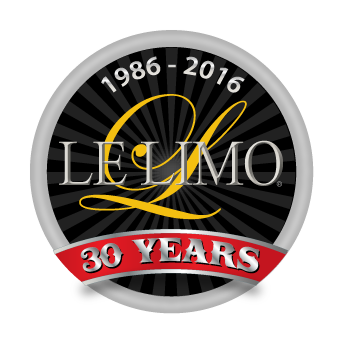 To celebrate their 30th anniversary, Le Limo is running special promotional offers all year long….